In the light of William and Kate’s 5 th wedding anniversary on 29 th April, I’m writing about their Davison chart. I’m fortunate enough to have Kate’s birth time, as I was requested, from one of the guests who attended their wedding, to write a synastry chart as a wedding gift for the royal couple. The essence and goal of their relationship, shown by the composite Sun’s sign in dynamic fire sign Aries, is to boldly take on action and challenges in a pioneering, highly individual way. Falling in the karmic 12 th house of the soul; the growth and learning takes place through dedication to selfless service and devotion to a higher ideal. Being of service is an important theme in the royal couple’s chart, with their 6th house being the most occupied. The Sun’s dispositor Mars is in peaceful warrior Libra, as is William and kate’s natally. Libra, the sign of relationship is in fact the most emphasised sign in the chart. Their role is far from being an easy one, however, shown by the t-square with Mars, Sun and Moon. While Kate and William are natural peace seekers, who need time to think before they act, this fiery warrior Sun sign calls for quick decisions. There’s no time to sit on the fence when action is constantly calling. William and Kate’s Davison Moon is in its home sign Cancer, like their own natally. Squared by the sun; what they want and what they need are in conflict. Their home, family and security are of paramount importance to them, even more than that; it’s their path to fulfilment.as well as their karmic contract together. 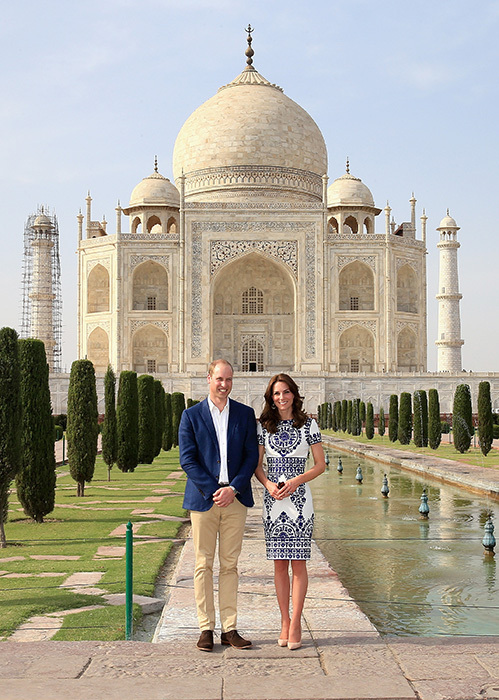 William’s Sun is conjunct the north node, while Kate’s Sun conjunct the south node. A continuation of that which had begun before in another life time? They are plugged into this t-square in the Davison chart, directly, William through his natal Moon and Mars and Kate through her Sun, Moon and Mars, highlighting their commitment to the lessons and challenges of their relationship. Mercury, the chart’s ruler is also in Aries in their composite chart; the spring bird has sung. Mercury at the critical, solstice point of 0 has a freshness and power to it. Communication is raw, direct and vital. The birth date of the Davison chart is 1 st April; like the fool in tarot, there is an abundance of potential. Although the journey is unknown, he is equipped with courage, faith and energy to take it. 0 degrees is a prominent feature in many royal charts, for example, William has his Sun at 0 degrees Cancer and his son Prince George has his Venus at 0 degrees Virgo. William has a Gemini Mercury natally, trined by Kate’s Aquarian Mercury, which harmonises well with the Davison chart. Communication is a key part of their relationship. They will never run out of conversation and because of the ease of communication between them are able to sort out any problems through talking them over. In the Davison chart, Mercury is trined by Uranus, indicating that they have an electric mental connection, stimulated by progressive and original ideas. It’s interesting that as transiting Uranus conjuncted their Davison Mercury in June 2010, it was publically announced that William and kate would be living together. This marked a breakthrough in their relationship; after a few relationship hiccoughs. Kate stopped working and devoted her time to William and her new role within their relationship. After several false alarms, wedding bells was finally on the cards, with their engagement finally announced in November 2010. Princess Charlotte, the royal couple’s 2nd child, was born in May 2015, just as Saturn was moving into the couple’s composite 7 th house. This ties in with the increased responsibilities and duties that having a second child would undoubtedly have brought, deepening their commitment to each other. The bedrock of Will and Kate’s love is friendship, shown by Venus in Aquarius in the 11 th house. They were friends for a long time before starting a romantic relationship. Kate’s natal Venus is also in Aquarius while William’s is in Taurus, forming a tight square to the Davison one. Venus in Taurus and Venus in Aquarius express love in totally different realms. While fixed earth Taurean love is rooted in the terra firma of the sensuality of the earth, fixed air Aquarian love is elusive, transpersonal and ethereal. There are ample opportunities for learning and changing perspectives through accommodating different values, and expressions within the marriage. The asteroid Vesta in William’s natal chart is on their Davsion Venus. Vesta in a chart shows where we are most dedicated, and what ignites our light. This is a fantastic inter-aspect for the relationship. Vesta in the Davison chart is near the cusp of the 10 th house, further illuminating the theme of serving society and living up to the public’s expectations. While the placement of Vesta indicates what lights our fire, it also shows where we can burn out. So here in the 10 th house, there is a necessity for the couple to retreat from the public eye every now and again in their Moon in Cancer way, to recharge energies. Uranus in Sagittarius in the 7 th house is an unconventional relationship, which thrives on openness, honesty and spontaneity. They are a modern, facebook generation royal couple, carving a new set of values, roles and images for future royal families which transcend the Saturnian rigidity and tradition of royal customs that was the hallmark in yesteryears. It’s no longer an interbreeding of bluebloods. The freedom now exists to make partner choices Outside of the narrow gene pool of nobility.